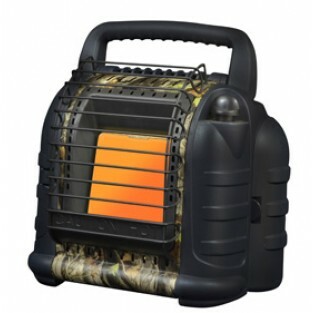 The Mr. Heater MH12B Hunting Buddy Heater is a portable 6,000 to 12,000 Btu space heater that can be used for outdoor recreational applications. The heater attaches to either a 20 lb propane cylinder with an optional hose and filter or a 1 lb disposable propane cylinder with a new swivel out regulator. The heater also comes with extra storage space that can house a spare 1 lb propane cylinder, gloves, or other accessories. This portable space heater has an automatic safety shut off in case of accidental tip-over or low oxygen. The MH12B Hunting Buddy Heater is perfect for outdoor activities including hunting, camping, and tailgating as it comes equipped with a quiet electronic ignition, a camouflage faceplate, and a heavy-duty burner guard.